How were picture postcards made? 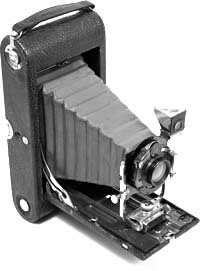 This camera and others like it took postcard size negatives which then made the postcards. Real Photo Postcards were just regular pictures developed on pre-printed postcard stock. When having your film developed, it was an option to receive plain prints or postcards. Learn about the history of the photo postcards with the Real Photo Postcards KwikGuide. A companion website gives the reader high resolution color images of all the photographs and vintage advertisements in the book. This website gives the reader of the economical black and white printed book a look and the enchanting colors of the media at the time. These vintage postcards are sometimes called picture postcards or RPPC ( short name for Real Photo Postcards). These were actual photographs (hence the name Real), taken by our ancestors or studio photographers, that were printed on postcard blank. This KwikGuide is the first book written for the genealogist and historian that wishes to understand the special place these postcards held in society, and when they were made. A Guide to Identifying and Dating Real Photo Postcards of the 20th Century. 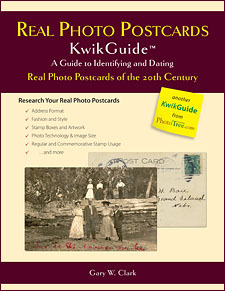 Real Photo Postcards KwikGuide is a fun guide to the popular postcards in the early 20th century. This guide is a required reading for genealogists, family historians, postcard collectors, and vintage photograph enthusiasts. The KwikGuide presents a short history of all postcards and then covers Real Photo Postcards in detail, including how to recognize and date them. Dating postcards is important to understanding who the subjects in the picture may be. For collectors, determining the date of a photograph may help understand the rarity and value of a postcard. Typical clues for dating postcards such as stamps, stamp boxes, and card format are illustrated with fine images from the PhotoTree.com collection. A companion website allows the reader to view high resolution, color images found in the Real Photo Postcards KwikGuide.